FYEO | What Does FYEO Mean? 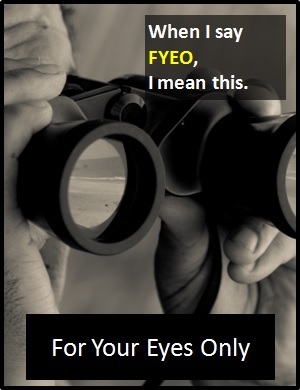 FYEO means "For Your Eyes Only". The abbreviation FYEO is used in internet and text chat to mean "For Your Eyes Only". It indicates that what the sender is about to share is only meant to be seen by the recipient and should not be shared further. FYEO often precedes the sharing of "juicy gossip" or explicit photos. FYEO may also mean "For Your Ears Only". FYEO can also be written as 4YEO. "For Your Eyes Only" is the title of the 12th film of the James Bond franchise. Released in 1981, it starred Roger Moore in the role of Bond. FYEO means something is for you, and only you, to see. Lucas: What are you wearing? Hannah: I'll show you, but it's FYEO. Rhea: I'll show you my new lingerie, but it's FYEO. Okay? As it is pronounced using its individual letters (i.e., "Eff Why Ee Oh"), FYEO is classified as an initialism abbreviation. Initialisms are different to acronyms, which are spoken like words. Before the digital era, we would have said something like "This is between you and me" instead of using FYEO.